We use this alignment with our Atom team to get a quick shot on net after winning the face-off and jump on a rebound if available. 1. The C must be a left handed shooter. 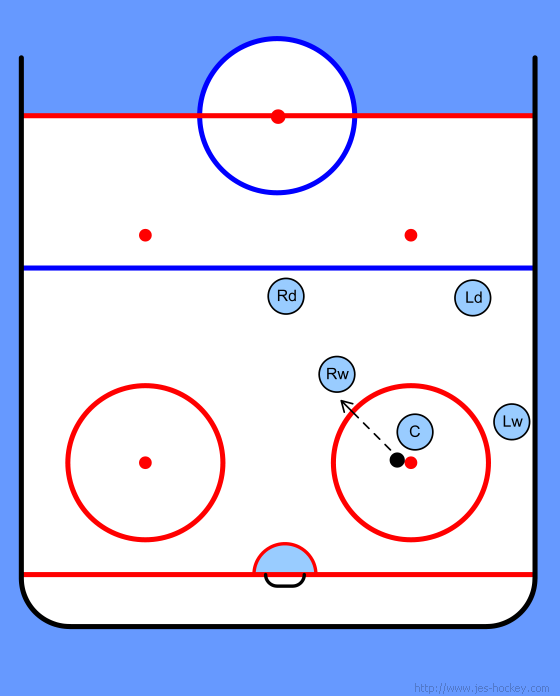 The Rw is positioned at the top of the circle, directly in the path of the puck. 2. C wins the draw to the Rw. 3. Rw takes a quick shot on net. Rd and Ld stay high to draw the opposing team wingers. 4. All three forwards crash the net as soon as shot is taken in the event there's a rebound. C stays somewhat high in the slot, Rw and Lw go straight to the net.